Feels like summer... Break out the sidewalk chalk! And when we say break out, we mean let’s get some plaster of paris and food coloring and make ourselves some sidewalk chalk. It’s really easy, at least according to all the children’s craft/parenting websites that came up when I searched for the recipe: 1 part water, 2 parts plaster, a splash of food coloring, mix until the consistency of thick frosting. 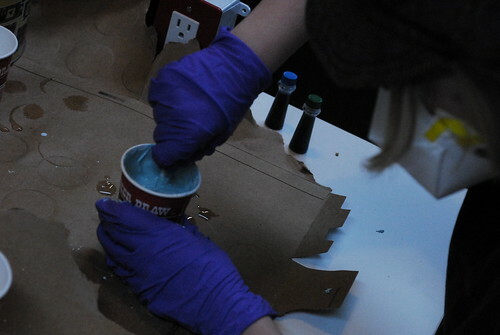 Also, put in the food coloring with the water and then add plaster for evenness of pigment. You might notice that I’m wearing gloves and a respirator mask for this project. The plaster of paris is messy and will stick and set if it gets wet (which is why I put down some cardboard on the table, too). The mask might just be me being paranoid, but plaster of paris is pretty fine and I am mixing this right in front of my face. 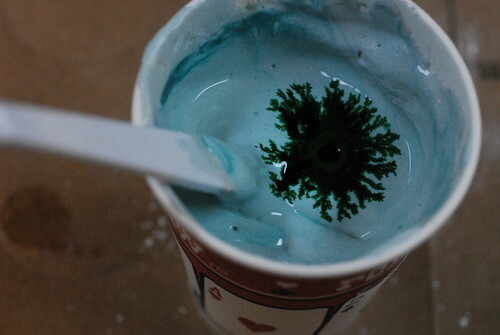 I’m using little paper cups for molds, but you can use almost anything flexible or rippable, as long as you can free the chalk from the mold after it sets. After the prototype batches I think I’ll do a bigger batch and try using TP tubes for molds. It looks like it’s setting pretty fast, and the internets say that is should be cured and ready to go by tomorrow afternoon about this time. I’ll tell you how it goes.